Where’s The Nurse? 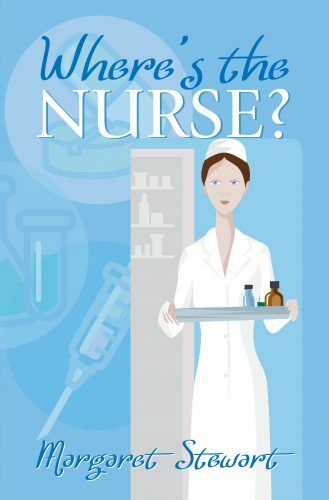 is an entertaining, warm and true story of a long nursing career. 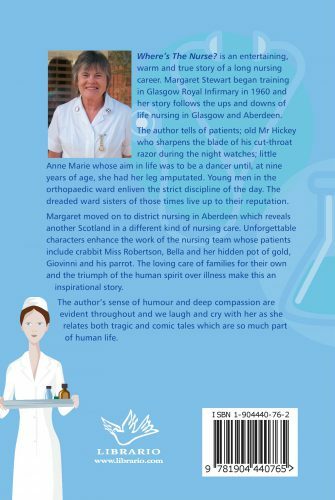 Margaret Stewart began training in Glasgow Royal Infirmary in 1960 and her story follows the ups and downs of life nursing in Glasgow and Aberdeen. The author tells of patients; old Mr Hickey who sharpens the blade of his cut-throat razor during the night watches; little Anne Marie whose aim in life was to be a dancer until, at nine years of age, she had her leg amputated. Young men in the orthopaedic ward enliven the strict discipline of the day. The dreaded ward sisters of those times live up to their reputation. Margaret moved onto district nursing in Aberdeen, which reveals another Scotland in a different kind of nursing care. Unforgettable characters enhance the work of the nursing team whose patients include crabbit Miss Roberston, Bella and her hidden pot of gold, and Giovanni and his parrot. The loving care of families for their own and the triumph of the human spirit over illness make this an inspirational story. The author’s sense of humour and deep compassion are evident throughout and we laugh and cry with her as she relates both tragic and comic tales, which are so much part of human life.